The Eastwood and District Members' Centre of the National Trust for Scotland draws its membership mainly from the southern suburbs of Glasgow and parts of East Renfrewshire. The Centre is a very friendly hub of around 200 NTS supporters. Our committee organises a varied programme of Winter Talks, Theatre and concert outings and trips to a variety of destinations throughout the year. Occasionally, for good measure, we entertain our members to a Burns Supper "with a difference". All of our activities have a two-fold purpose - we raise funds for the Trust and have a thoroughly entertaining time in the process! As we enter our thirtieth year we can testify to the truth of the saying "a stranger is just a friend you do not know". 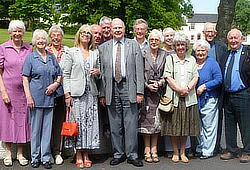 Many of our members have created lasting friendships as a result of a coach trip or an event at Holmwood House. We try to support Holmwood House in our annual giving to the Trust. In 2015 we donated over £4,000 to various NTS properties and projects (including Hill of Tarvit, Glenfinnan, House of the Binns, Ben Lawers, Culross and Falkland Palace). In addition, we try to assist Holmwood House as and when financial needs arise and have recently financed the renewal of the kitchen. Many of our members are regular volunteers at Holmwood - in the tearoom, in the garden and in the capacity of guides. We try to throw our weight behind the big fun events, especially at Halloween and Christmas when Holmwood can play host to many hundreds of young folk. Our volunteers metamorphose into authentic witches, wizards, scarecrows, Santa’s helpers and "sic like fowk". Holmwood does indeed lend itself to permitting us to relive our youth! Members receive two newsletters each year which contain all the details of planned outings. It is a testimony to our Outings Organisers that each outing is fully booked (with a long waiting list) within days of our mailshot. Our Talks Organisers similarly receive an excellent response to their programme (all talks take place in Clarkston Hall). An extremely profitable raffle is held at each of these talks which help to offset our rental costs. Members are welcome to bring friends to any of our events. The Centre is open to all members of the NTS (or National Trust in other parts of the UK). Our annual membership is currently £10 which covers administration costs. We welcome new members - do come and meet us and remember - our witches and sic like fowk are a friendly breed! Help publicise the NTS and make membership of the Trust more enjoyable and effective. Promote a series of talks each winter at Clarkston Hall. Organise outings to places of historic and environmental interest and arrange concert and theatre trips each winter. Provide volunteering opportunities with the NTS - particularly at Holmwood House. Raise funds, providing regular support to Trust projects. In addition to these social events the Centre arranges for volunteers to help at local National Trust for Scotland events. In particular the Centre provides volunteer guides and helpers at Holmwood House- a property which enjoys a special relationship with the Centre's membership. Volunteers are always required for Holmwood. If you would like to help in any way contact Mr Iain McGillivray (tel: 0141-638-0838) or Jim McDowell (tel: 0141-637-2129) or e-mail: jmcdowell@nts.org.uk). For further information regarding Eastwood and District Members' Centre please contact the Secretary, Mrs Mary MacLennan at 0141 639 5411 or e-mail: Iain.Maclennan@lineone.net.